You'll be £18.00 closer to your next £10.00 credit when you purchase Wings Over the Waves. What's this? This is the biography of one of the Royal Navy's legendary pilots. BF or Daddy as he was known, started his career at Dartmouth and then spent his early seagoing years in Hong Kong, Nagasaki and Hiroshima. His wartime experiences as a Fleet Air pilot aboard HMS Glorious included the historic air strike at Taranto and the search for the Graf Spee. In May 1940 he was loaned to Coastal Command and attacked German Panzer tanks in a biplane, defended Allied troops over Dunkirk and was one of only a few naval officers to fight in the Battle of Britain. After a period as a test pilot at Boscombe Down he became one of only four Wing Leaders in the Royal Navy. His successful leadership lead to many more successes, not least the crippling of Tirpitz as part of a diversionary plan in the lead up to D-Day.He was a superb pilot, loved by all the air and ground crew under his command. His reputation as a fearless and dynamic leader remains a legend today. The book contains detailed and graphic accounts of aerial sorties and strikes throughout the dark days over Nazi Europe. Tragically he was killed in action in July 1944, one week prior to promotion and a job ashore. The book includes many of his letters and extracts from his diary. Using diary entries, personal letters and official reports combined with newspaper clippings, the author has produced a dramatic and very readable account of this vital incident. This is a book for every naval aviator's book shelf and a must for any student of Naval Air Warfare. Thoroughly Recommended. 'Most readable', 'Most absorbing' 'One doesn't have to really be interested in Royal naval aviation to find it fascinating. This is the never-before told biography of one of the Royal Navy's legendary pilots. 'BF' or 'Daddy' as he was known, started his career at Dartmouth and then spent his early seagoing years in Hong Kong, Nagasaki and Hiroshima. His wartime experiences as a Fleet Air pilot abroad HMS Glorious included the historic air strike at Taranto and the search for the Graf Spee. In May 1940 he was loaned to Coastal Command and attacked German Panzer tanks in a biplane, defended allied troops over Dunkirk and was one of only four Wing Leaders in the Royal Navy. His successful leadership lead to many more successes, not least the crippling of Tirpitz as part of a diversionary plan in the lead up to D-Day. He was a superb pilot, loved by all the air and crew under his command. His reputation as a fearless and dynamic leader remains a legend today. The book contains detailed and graphic accounts of aerial sorties and strikes throughout the dark days over Nazi Europe. Tragically he was killed in action in July 1944, one week prior to promotion and a job ashore. The book includes many of his letters and extracts from his diary. Graham Drucker is the son of Baker-Falkner's sister Leslie and was born a decade after his uncle went missing. He has spent over 38 years researching his uncle's wartime career and has written articles for aviation magazines and is Director of Fleet Air Arm Officers Association and the Swordfish Heritage Trust. He plays an active role in international environmental and conservation charities, along with the Council of Europe, European Commission and United Nations. I'm finding this book "Wings Over Waves" most readable. I've not finished it yet! Most absorbing and, as I say, easy to read although it's smallish print and, therefore, a lot of it! It gives you Lt. Cdr. Roy Baker-Falkner's complete life from being born in Canada, details of his life in the RN as a 'Middy' onwards. One doesn't have to really be interested in the Royal naval aviation to find it fascinating. Much of his and his family's life is spent living in Shaldon near Teignmouth, so I found that very interesting. He and his wife 'aren't sort of a bob' consequently they socialise, with the nobs! Particularly in the 30's (one officer is quoted as saying 'The FAA was a very nice club, during the 'phoney war', you name, we did it). Roy is rather also twee when writing to his wife. (Ed. I found that even in the 60's they 'lived the life of Riley' - but they did arrange football matches for the ratings!!!) I liked the bit where they said, i think it was when flying off Egypt, 'We're flying in minimum clothes it's so hot [mostly Khaki shorts & shirt & no underwear?] I may write some more on the book next NewsLetter. Because I don't want you to think that I'm belittling the bravery, effort & work that He & his betheren achieved. A brilliant pilot and a capable leader, his career culminated in leading the Operation Tungsten strike against the German battleship Tirpitz. Baker-Falkner played a key role in ironing out sufficient of the problems with the troubled Barracuda aircraft for it to be the effective dive bomber that inflicted serious damage on the enemy capital ship on pril 3 1944. Graham Drucker is Baker Falker's nephew. He has clearly developed a great interest in both his distinguished uncle and the FAA in general, having become Director of the Fleet Air Arm Archive 1939-1945 website. He has certainly built up a remarkable wealth of material that he has used to compile this considerable biography, Wings Over The Waves. Canadian dominion Dartmouth cadet decided to join the 'Fleet Air Arm of the Royal Air Force' is an interesting case study of contemporary Naval training and FAA entry in the period of dual control. It is also interesting to see the effects of the change to full Royal Navy Control, eg giving observers command of squadrons. Baker-Falkner served in the carrier Glorious in the Mediterranean and the book makes some interesting contributions to the controversy about the character and abilities of Captain D'Oyly-Hughes. Happily Baker-Falkner had left the ship by the time she was sunk and he spent most of 1940 operating swordfish from land bases, first in support of the Dunkirk evacuation and then against the invasion threat with many minelaying and bombing sorties. He rejoined 812 Squadron which had just been redeployed to the Orkenys. The author raises the interesting possibility of what might have been achieved, if these experienced aircrew had been transferred to Victorious for the Bismarck chase, as requested by the squadron commanding officer. Baker-Falkner was transferred to Victorious to replace her depleted air group as Furious was short of fuel, a problem with the converted old 'large light cruisers' that had its impact on the earlier HMS Glorious debacle. Baker-Falkner was now posted to HMS Condor at Arbroath, then the deck landing training school where he would be an instructor with 767 Squadron, during which period he starred in an Ealing Studios RN information film Find, Fix and Strike. He then moved to Boscombe Down as a test pilot, where, among other aircraft, he helped solve many of the problems of the none-too-satisfactory Barracuda. This led to command of a Barracuda squadron, 827, which had just suffered a number of fatal accidents with the tricky aircraft. While building the efficiency of this unit he was also chosen to re-write Fleet Air Arm doctrine - the Naval Air Fighting Instructions - an influential and key duty which demonstrated the value placed on him by his superiors. He was a natural choice to lead one of the new Torpedo Bomber Reconnaissance Wings, the Eighth, which grouped 827 with 830. This led to the attacks on Tirpitz and other operations against Norway to keep the Germans guessing as to where the Allied blow against western Europe might fall in 1944. The book clearly demonstrates the enormous strain under which Baker-Falkner and the other aircrew were working. This is a major strength of the book. The constant loss of accident as much as, if no more than, to enemy action, was an unfortunate and all-too-common feature of Fleet Air Arm life, one which it is all too easy to overlook. It is significant to see in the excellent illustrations how Baker-Falkner, still in his twenties, visibly aged at this time. The circumstances of his tragic and needless death are considered without coming to a fixed conclusion. Some say the Commanding Officer of HMS Formidable, Captain Ruck-Keene, demanded that special patrols be flown against reported U-Boat trap. Othe trustworthy first-hand sources assert that it was Baker-Flkner who insisted he flew. Perhaps he thought that if patrols had to go up at all, he should fly one of them. There had been celebrations in the mess after the day's operations seemed to be over and 'B-F' thought the senior officers were in the least bad condition to fly. Sadly an aircraft with defective equipment was chosen and the stage was set for disaster. The book holds one's attention. No reader will put it down without feeling they have truly experienced the dynamics of life in the Fleet Air Arm during the war and the strains it put on both the personnel and their families. An interesting, absorbing and worthwhile book, which gives Baker-Falkner the retrospective recognition he clearly deserves. It was a pleasure to be able to pick up this book which has been so well researched and for which the author, in his family relationship with his lost Uncle, is able to ensure that accuracy is never lost in this, a biography of one of the Fleet Air Arm's legendary leaders. The year of the Fleet Air Arm's 100th anniversary (2009), encouraged a number of so-called FAA history books yet in several cases the efforts might best be described as dross, aimed to make a buck and to catch an opportune market. Trying to catch the broad spread of FAA operations often did not work for the simple reason that the human element got lost. 'Daddy' as he was known started his career at Dartmouth after leaving his native Canada and then spent his early seagoing years in Hong Kong, Nagasaki and Hiroshima. He joined the FAA when it was still part of the RAF and went on to carry out over 100 operations against the enemy during World War II. His wartime experiences as a pilot aboard HMS GLORIOUS and preparing for the historic air strike at Taranto whilst stationed in Malta and Egypt are but a part of the story. In May 1940 he was loaned to RAF Coastal Command and attacked German Panzer tanks in a Swordfish biplane, defended Allied troops over Dunkirk and was one of the Few, naval officers who flew in the Battle of Britain. After a period as a test pilot at Boscombe Down he became one of only four Naval Air Wing Leaders in the Royal Navy. His successful leadership lead to many more successes, not least the crippling of TIRPITZ. He was a superb pilot loved by all the air and ground crew under his command. His reputation as a fearless and dynamic leader remains a legend today. The book contains detailed and graphic accounts of aerial sorties throughout the dark days over Nazi Europe, the Middle East and the Mediterranean. Tragically he was reported missing in action in July 1944 one week prior to promotion and a shore job. The book includes many of his letters and extracts from his diary and also contains a goodly number of black and white photographs which will be new to many. Opening the Acknowledgements page it is clear that the research for this book has indeed been substantial. Many worthies so acknowledged over the considerable time the author has worked on his book have regrettably now departed. Work for the Fleet Air Arm Officers' Association website to more accurately record the attack on TIRPITZ resulted in contact with one of 830 Naval Air Squadron' observers, Professor David Brown (ex-RNZNVR who died in 2009), but it was clear in many conversations with this but one member of Baker-Falkner's squadrons the immense regard with which all held the Strike Leader. The author, Graham Drucker is the son of Baker-Falkner's sister Leslie and was born a decade after his Uncle went missing. He has spent over 38 years researching his Uncle's wartime career and has written articles for aviation magazines and is the Director of the Fleet Air Arm Archive 1939-1945, the website dedicated to wartime veterans and their exploits. For the past 25 years he has played an active role in international environmental and conservation charities along with the Council of Europe, European Commission and the United Nations. 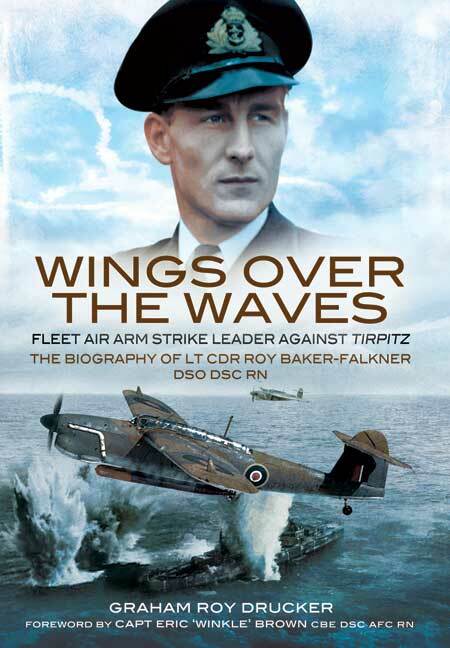 The author has advised that the whole biography is a labour of love started back in the 1970s and "only really completed when seeing old veteran friends and colleagues of my uncle Roy Baker-Falkner were getting older and realising that their wartime FAA endeavours were increasingly being forgotten, even during the centenary of naval aviation celebrations the FAA Tirpitz strikes were initially overlooked". "Roy Baker-Falkner was in the thick of it through much of the war, and he and fellow air and ground crew were under tremendous strain. Later he became an instructor, film star and even test pilot on the Fairey Barracuda and Grumman Avenger before leading one of the first Strike Wings against Germany including the TIRPIZ action and in leading the way to the go ahead for D-day - a FAA fact now totally forgotten". "My one goal with the biography is to ensure that the name of Baker-Falkner and the endeavours of all his wartime colleagues are never forgotten". "Hopefully by any review of the book it can help ensure that the story gets out to those veterans who still know of Roy Baker-Falkner, to their families (as many sons/daughters, grandchildren and great grandchildren do not know what their fathers and granddads did) and to those in the current FAA who might just understand a little more about the supreme efforts that were carried out by their predesssors. Their names will not be forgotten". There is little a reviewer can add but to say this book is a valuable contribution to the history of the FAA. It is detailed, readable, fascinating and absorbing. If you are interested in flying, WWII, the FAA, or what makes leaders then this is highly recommended as "a buy". The story of a long-forgotten war hero who spent two happy years in Malta has been revealed in a recently published biography written by his nephew. The biography of Lieutenant Commander Roy Baker-Falkner is the result of 38 years of research by author Graham Roy Drucker, who spent his formative years fascinated by revered talk of his heroic uncle, killed in action aged 27 while trying to save 150,000 men from attack by a wolf pack' of German U-Boats. "Even when I was very young I would listen to my mother and my aunt talking about him and I was eager to leam more. His memory was very much alive in my family," Mr Drucker told The Sunday Times. Author Graham Roy Drucker holding a copy of the biography. Lt Cdr Baker-Falkner was stationed at RAF Mai Far from 1938 to 1940 as a Fairey Swordfish pilot in 812 squadron, which regularly conducted exercises in the Grand Harbour from onboard the aircraft carrier HMS Glorious. He lived with his wife Naomi in a house appropriately named 'Roy' on Rue d'Argens, Sliema, and in later years his widow would often recall their time together in Malta with particular fondness. "I visited the house about two years ago and funnily enough its owner - who lived close by as a boy - remembered my uncle because he had a big dog, which was unusual at the time," Mr Drucker said. Lt Cdr Baker-Falkner and the HMS Glorious returned to the UK in 1940, and he was one of the few Allied pilots who flew bombing raids over Dunkirk, attacking German Panzer tanks in his Swordfish. Later, he was one of the few navy officers to serve in the Battle of Britain and by the end of 1940, most of the pilots he had trained with had been killed. In April and May 1941, Lt Cdr Baker-Falkner returned to Malta as a Swordfish pilot protecting the convoy Operation Dunlop, which ferried hurricanes on Ark Royal and HMS Argus. He made front page news in 1944 when he led the Fleet Air Arm's largest air attack up that point, of 100 dive bombers and fighters against the huge German battleship Tirpitz, sister ship of the Bismarck, which was hiding in a fjord in the Norwegian Arctic. Although the ship wasn't sunk, it suffered significant damage which took two months to repair. The Times of Malta reported this attack in April 1944. Only weeks after the Tirpitz attack, Lt Cdr Baker-Falkner was returning from another operation in Arctic Norway when the Admiralty intercepted Enigma messages that the returning fleet-carrying 150,000 men - was facing imminent attack by a wolf pack of 15 enemy U-Boats. Although the Arctic weather was terrible, Lt Cdr Baker-Falkner volunteered to fly off HMS Formidable and search and sink the enemy subs. He was never seen again. The biography goes into detail about those missing hours, describing how Lt Cdr Baker-Falkner maintained radio silence despite knowing he was in mortal danger, so as not to alert the enemy of Allied positions. "That sacrifice was typical of him, he always put others before himself," said Mr Drucker. The book includes many of his letters and extracts from his diary and also describes the anguish of his widow and two daughters, who were aged eight months and three years when he went missing. "His widow died in 2000 and one of their daughters told me at the time she felt she didn't know her dad at all - she had met him only twice as a very young girl. That was further motivation for me to the write the biography," Mr Drucker said. Lt Cdr Baker-Falkner and his wife's affection for Malta was passed down to Mr Drucker and his family, who visit often on holiday even 70 years later. Mr Drucker hopes the biography of his uncle might kindle some interest in the intended restoration of the Swordfish plane owned by the Malta Aviation Museum in Ta' Qali, which is one of only 12 Swordfish remaining in the world. The museum would like to return the plane to flying condition, but this depends on funding. The biography, entitled Wings Over the Waves, can be ordered from the publisher Pen and Sword fwww.Den-and-sword.co.uk/?Droduct id=2584). Signed copies are available direct from the author at druckerigibtintemet.com. A ONCE-forgotten war time hero from RAF North Coates who sacrificed his life to save 150,000 men will be remembered forever as his selfless actions are documented in a moving biography of his life. Today, as we remember the young men who gave their today for our tomorrow, the family of local hero, Lieutenant Commander Roy Baker-Falkner, are finally telling the world his heroic tale and preserving his name in history for the first time. Mr Baker-Falker, a naval aviator of the Fleet Air Arm, tragically died in 1944 trying to save 150,000 men from attack by a wolf pack of more than 15 U-boats in Arctic Norway, just one week before he was to take promotion and a job onshore. Now his nephew, Graham Roy Drucker, has written his 'forever. Mr Drucker, from the Isle Of Wight said: "My middle name is the same as his, in his honour. I have grown up thinking about him and hearing his heroic tales. However, when I went to museums, I could never find his name, even on our memorials. He wasnt listed.I was shocked. Of course, the veterans remember him, but they have nearly all gone now. It is sad and I hope the book will bring his name back." Mr Baker-Falkner and his fleet were posted to RAF North Coates in the dark days of June 1940, because there was a shortage of RAF airmen following the Battle Of Britain, which Mr Baker-Falkner fought in. In 1944, Mr Baker-Falkener led the Fleet Air Arm's daring attack against the German battleship Tirpitz in the Arctic and made headline news in The Times. But tragically, just weeks after the attack, as he returned home from another operation in Arctic Norway, intercepted code messages warned him the returning fleet was under imminent attack by a wolf pack of enemy submarines. The bitter Arctic weather made flying near impossible, but knowing his fleet's lives were in danger, Mr Baker-Falkner volunteered to fly out and sink the enemy. He managed to fend off the attack, saving all 150,000 but on his way back, the Arctic conditions made it impossible for him to go on. Knowing messages were being intercepted, he did not call for help but instead stayed silent so the enemy would not know where his men were. His body was never found and he left behind his loving wife, Naomi, and two young daughters in North Coates. Mr Baker-Falker never had a grave. His name, like so many others, was missed out of the history books and museums and for more than 70 years, only his family knew the husband, brother, uncle and hero's selfless actions - until today. We were happy to help Mr Drucker in preserving his uncle's memory. We are always turning up these little gems of stories that we didn't know about, but that came from the North Coates RAF base and this is another one. We are very pleased this story has come to light. North Coates RAF Base was quite amazing and played a significant part in the Second World War. Many of the lads never return and, likeLieutenant Commander Roy Mr Drucker said: "This Remembrance Day is the first time other people will be remembering my uncle. It is nice to know the book exists for the first time on this day. It is much more than keeping his memory alive, this is my own personal way of remembering him." Wings Over Waves is available on Amazon.co.uk now and will be available from Waterstones in Freshney Place, Grimsby, soon. Keep checking your Grimsby Telegraph for details. Mike Speakman, chairman of the North Coates Flying Club. The wartime biography of LT CDR Roy Baker-Falkner, a Royal Navy Fleet Air Arm pilot, is a detailed and heartfelt narration of one of the most loved and admired pilots of his day. 'BF' or 'Daddy', as he was so often called, began his seamanship career in Hong Kong, Nagasaki and Hiroshima; before joining the RAF and undertaking over 100 military operations throughout WWII. His time aboard the HMS Glorious saw preparations for the Taranto air strikes in addition to the active search for the Gaf Spree, and he was only one of a minor few naval officers who fought in the Battle of Britain. As his experience grew, so did his effectiveness in his positions - most notably was that success which saw the demise of Tirpitz as a diversion in the progression towards D-Day! With inclusions of his diary entries, and many of his personal letters, his courageous and forthright personality is aptly projected in this interesting read. His tragic end remains a mystery, since being reported missing in July 1944, but his fearless and determined lives on this the story of this book. A truly captivating read, which is recommended for both historians and readers with military interests alike.